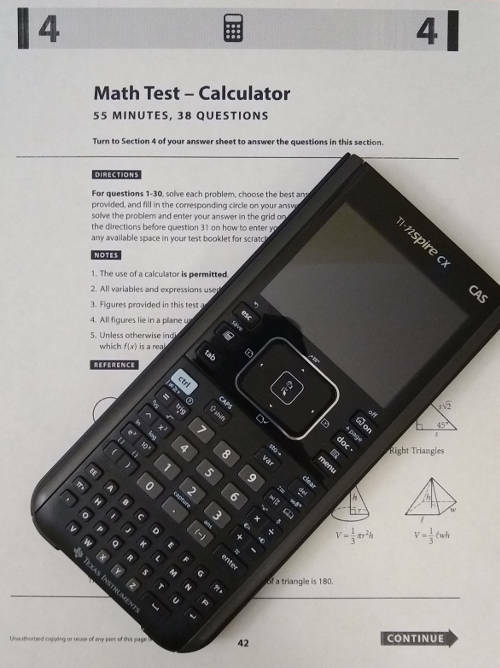 I picked the TI-Nspire CX CAS as the best calculator for the SAT. No calculator that can communicate wirelessly, like a phone, an iPod Touch, or via an infared port. No stylus or pen based devices (so no Casio ClassPad), and no tablets like an iPad or Nexus. No calculators that have a computer-like “QWERTY” keyboard. Even though all TI-Nspire models have had a keyboard for many years, you will notice it is alphabetical, not QWERTY, like a computer. Who knows why the College Board hangs onto this rule? No calculators that have to be plugged into an electrical outlet. What Calculators Are Acceptable on the SAT? Most Casio and HP models are just fine, including the new Casio Prizm. The HP Prime is the only touch screen calculator allowed as of 2019. This list is not all-inclusive, but it does cover the most popular calculators on the market today. You will want to take advantage by having a graphing calculator on the test. One last important note on the SAT rules–you are allowed to bring more than one calculator. You can only have one out at a time, but you can switch whenever you feel like it with the spare you have under your desk. It is strongly advised to bring a backup calculator in case your primary has a problem. For more information, visit SAT acceptable calculators at the College Board website. If you’re looking to do some study for the SAT, check out my post on the best SAT prep courses. Whether you are looking for some last minute cramming or to bulk your skills up over long term, there’s a program for you. Also, if you’re thinking of also taking the ACT, be sure to check out my post on calculators for the ACT.